Someday, driver in my office recommends me to the most favorite meatball depend on his tongue. He calls it Bakso Jawir, he always comes to the restaurant together with the chief to take care client. Almost the client come from Japanese and they very interested with this meatball. He tells me that the meatball taste is spicy (very hot) and its make me curious cause I like spicy food too much. With the curiosity, I am browsing about the meatball and I find that the nearest location of Bakso Jawir at Tanjung Duren. In fact, the meatball is very famous food as the best meatball in Jakarta that recommend to try. 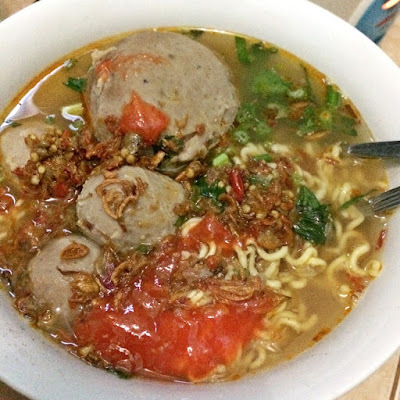 At the weekend I decide to buy Bakso Jawir and to know how delicious it is. In one bowl, one portion contains with big meatball (meat and egg on the inside) and a tiny meatball that I forget how many tiny meatball is than noodle, vegetables, fried onion and actually spicy pasta. The noodle serve too much and its make me full oh FYI friend onion and spicy pasta, serve too much and make it more delicious. About the price its around 28 K IDR. Are you wanna try?